This afternoon a thunderstorm over southern Mississippi underwent an evolution that is often associated with tornado occurrence in thunderstorms. 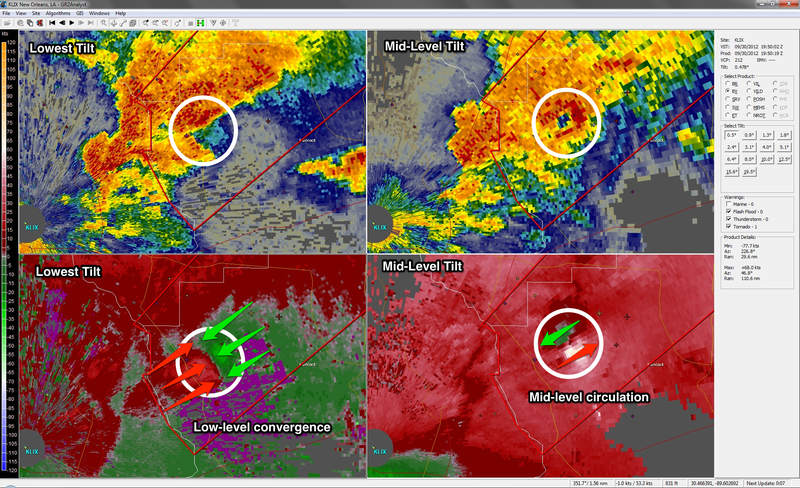 Whether or not a tornado developed remains to be seen, but the radar evolution was fairly classic. What do I mean? Before continuing, let’s remind ourselves that a tornado is an extension of a thunderstorm’s updraft. By definition, an updraft is a area where air is ascending. Furthermore, the mass continuity equation dictates that if air is rising, there must be convergence at the base of the updraft. This means that in the presence of a developing tornado, you may not find a rotational couplet; instead you might find a convergent signature, which is exactly what we see in the radar image above. In the next radar scan (shown below), as the (possible) tornado continues to develop (and move farther away from the radar site), we notice that the broad, low-level convergence still persists. However, in this scan, one can notice the addition of a rotational couplet in the midst of the broad low-level convergence. 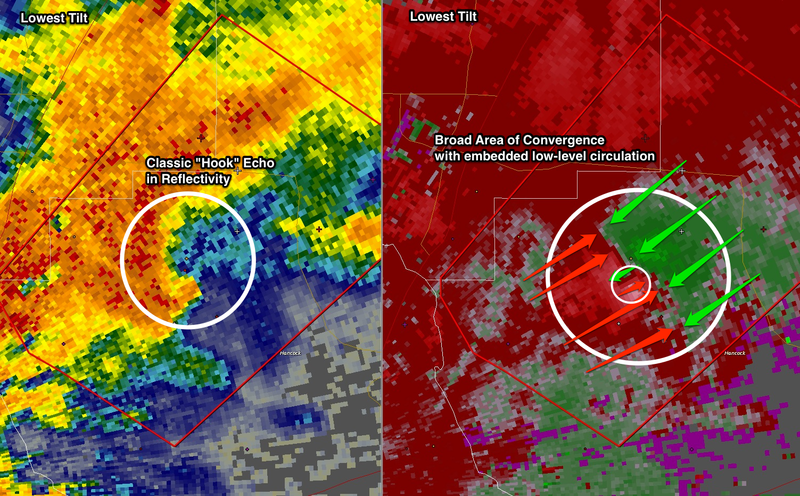 If one were to continue to follow the evolution of this (possible) tornado, one would find that the low-level rotation signature persists for several more volume scans…all in the vicinity of the broader, low-level convergence. So, what does this mean? When looking at radar data, it is important to examine the entire radar volume — not just the lowest tilts! Thunderstorms are very complex. What happens at low-levels typically plays a role in what happens in the upper-levels, and what happens in the upper-levels impacts what happens in the lower-levels.